Israeli soldiers placed, Friday, several concrete blocks, isolating Jabal al-Mokabber village, south of occupied East Jerusalem. 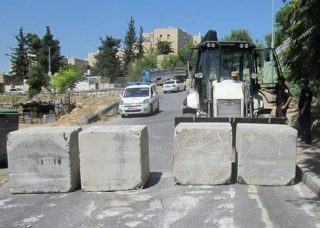 The soldiers first placed concrete blocks on the main road between Jabal al-Mokabber and Sur Baher, completely shutting down a man road leading to the village. The army also placed concrete blocks on the southern road leading to the village, and installed a roadblock on the main road, before the soldiers stopped and searched dozens of cars, and inspected the ID cards of the residents. Earlier at dawn, dozens of soldiers, and army officers, invaded the village, before the army and drove through its neighborhoods, before withdrawing and isolating it.